I have adjusted the voicing screws a lot on this piano over the course of my ownership, including recently, with no changes to this issue. I replaced the grommets on most of the piano, but I will double check because some seemed ok and I didnt switch them out. I'm not totally happy with the grommets I chose, and that could certainly be a factor for this issue. I will check to see the tines are screwed tightly to the tone bar, though as far as I know none of the tines have been ever been removed, replaced, or adjusted. Parts, Service, Maintenance & Repairs / Rhodes upper octave "scream"
I've looked around for a while and cannot find anything on this issue I'm having with a few notes in the upper octave of my Rhodes! Pehaps I am not naming the issue right, but the best way I can describe it is that I have a few notes in the top octave that have a sort of "scream" or "gargle" - basically it's a really fast beating. The sound is vastly more prominent when a note is struck acoustically without the piano plugged into an amplifier, but it does still create some unpleasant overtones when amplified, and it makes tuning these few notes much harder. My tech said some tonebar clips might help tame the "scream", but it did not. I've tuned to ET as well as a percision strobe tune Rhodes stretch map, which also had no effect. This is my Rhodes. It was made in the 26th week of 1974. It was sitting un-used in my highschool, and I asked to buy it around 2003, and the music director said "take it home, it doesn't have all the parts." It was only missing the screw for the leg braces and the sustain pedal rod! So yeah, it was free plus like 25$ for parts. Back then there were fewer places to get parts, but I got them I think from now defunct Speakeasy Vintage, which is where I got the stereo vibrato preamp you see in the photo (GREAT piece of gear - with the motion sound it nearly cures my suitcase envy and weighs a whole lot less). 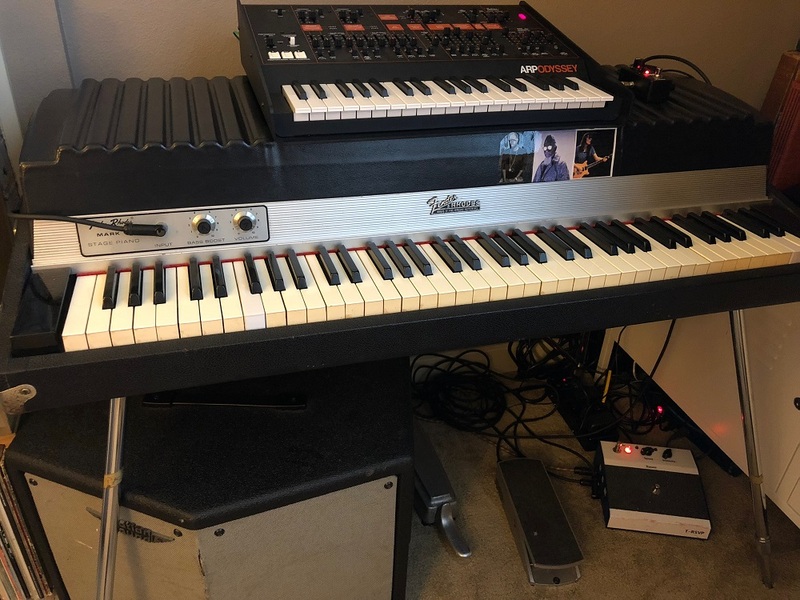 I also think I got the repro MK2 lid from Speakeasy to make stacking a nord on top easier (the original lid is at my parent's house in New England). Incedently, the ARP I got a few years ago fits amazingly on the MK2 lid too. Cosmetically, its pretty bad, but I kind of love that about it to be honest. It's got battle scars. Right around the time I got it, casters were bolted directly to the case and lid...if anyone has any constructive reasons why I should take the casters off (read: practical - save the handwringing about the sacred rhodes or cosmetic concerns), I'm all ears. With the casters, and the right car, I deal with this instrument entirely by myself (and I'm not a big guy at all). I have always gigged with it fairly regularly (less so these days, but still around once a month). It plays and sounds wonderful. Big fat '74 tone with good dynamics and range between bark and mellow tones. Miracle mod was done recently which was pretty life changing, and I re-did the grommets but will probably re-do them again with retro linear parts because the ones I got from avion studios were so-so. I have learned to do my own voicing and have it where I like it. I also do my own tuning, and I have it stretch tuned which I prefer. I tend to run it from the harp these days rather than the "input" jack. There are lots of other little things I will do when I have the time and money like new hammer tips, damper felts, and replacing some weak tines, but it's very playable as is. I've played some better Rhodes pianos and I've played a lot that were way worse, but I will never part with mine. It's been mine for too long and I love it way too much.